The most versatile rack-mounted RJ45 splitter for professional lighting solutions, perfect for fixed installations. The 10 port LumiSplit with A/B zone selection offers you the highest port flexibility at configuring multiple DMX lines. Manage and set-up all your lighting fixtures and LumiSplit devices through any RDM controller. Non-RDM lighting fixtures never behave strange anymore thanks to RDM filtering per port. LumiSplit 2.10 can be configured in different modes such as HTP/LTP merging mode and back-up mode. Full isolation safeguards the device against spikes and power surges on the network. With RJ45 connectors, Ethercon version of LumiSplit is designed for fixed installations. All LumiSplit devices have enhanced RDM features, which enable users to discover, manage and set-up every unit directly from any RDM controller. Even future upgrades can be executed over RDM. 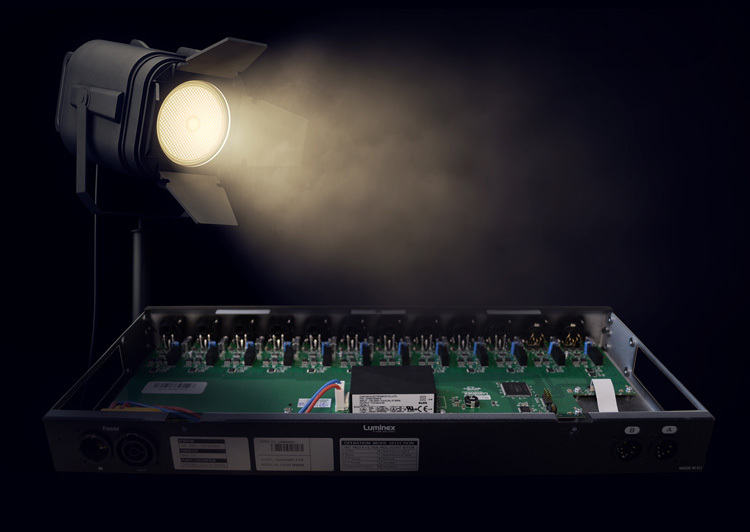 Based on 10 years of in-house expertise at developing bidirectional networking equipment between lighting controllers and fixtures, Luminex now brings you the most reliable, versatile and easy-to-use DMX/RDM splitter ever built.